Discussion in 'Computers & Technology' started by HAB, Jul 23, 2012. Recommendations? Say top end budget of $200, more like $100-150 ideally unless there's good reason to spend more. Sound quality, comfort, and durability are the three biggest priorities by far. Noise canceling isn't big deal either way. A built in mic would be kind of nice but definitely not a deal breaker. I'll pretty much just be using them for music. Thoughts? I 'd say Sennheiser HD280 PRO. I've been using Sennheiser headphones for a long time. If you got bigger than average ears, these are the way to go. Great sound, outstanding comfort (you can wear them for days) and definitely in your budget. Only downside is the look of them. They aren't what you consider as "stylish". i have found that sound quality for noise canceling has made great gains, with even the "worst" still being quite impressive. the achilles heel for most, however, is either durability (mine broke where the cup swivels at the head frame after just 4 mos), or battery life. Not sure how their headphones work, though. Will you use them only for home or office applications? Yeah I'm a fan of the Sennheisers too, I have a set of HD580's from years ago and they are still awesome. I still prefer an open headphone over a closed type especially in this sort of price range. It's a long term investment, spend as much as your conscience will let you. 2nd the Grados but that most of these models need an amp to work well otherwise you aren't getting your money's worth. Use will be a combination of while out playing off my phone (yes I know that won't get the best out of them) and home/office. Thanks for the recommendations. Made some research, because my Sennheisers are falling into pieces (after almost 8 years of daily use during commuting). There are tons of good offerings out there, even from "trendy" companys like Skullcandy. Maybe you can go in a music / DJ shop to test a few of them. If you are using them mostly with you phone on the go I'd probably go for something cheaper maybe the SR80i. You may have to look at the sensitivity of the headphones if you want to use your phone's output, my Sennheisers don't play all that loudly off portable devices. They are comfy but waaaaay to much bass. Audiotechnica ATH-A900. Very balanced sound with crisp bass and good stage given they are headphones. The only downside is that they are enormous. They also have relatively low impedance so they can be driven by portable devices. That grado advice was also very good though for that price I'd either spend less and get sr-60 or more and get allesandro ms-1 which are modified grado. As for Bose - they are the same **** as beats and skullcandy - gadgets with ****ty shound. I wouldn't say mostly, just sometimes. Thanks again for the suggestions. I'll try to find some of these to check out in person. They sound great, and are super reliable. Seriously. My wife and I just stayed in a hotel that had a Bose system in the living room. Terrible, terrible, terrible. Even she, who isn't into audio, wanted to know what was wrong with the sound. My boss has a set of Bose speakers for his computer, and he's always mentioning them. I haven't been able to break it to him that they're terrible. 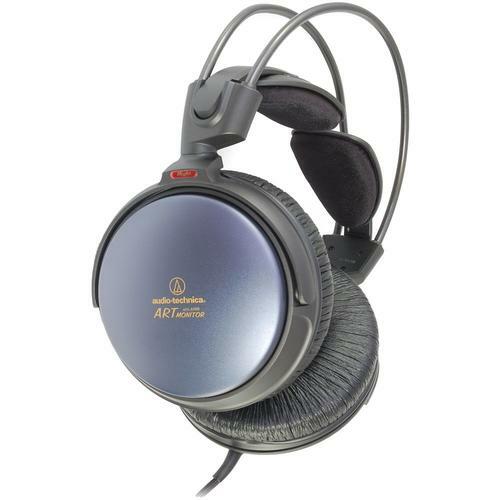 Audio Technica ATH-M50 are worth checking out. I think they're a bit over-hyped, but if you can get them at the right price, they're solid. I think I was able to get mine around $90 shipped, but that was before they really blew up. The open sibling of the AT that norbar (ATH-AD900) posted is really nice, but it's not 3x nicer.